Penelope is tied into the box with three white satin ribbons. 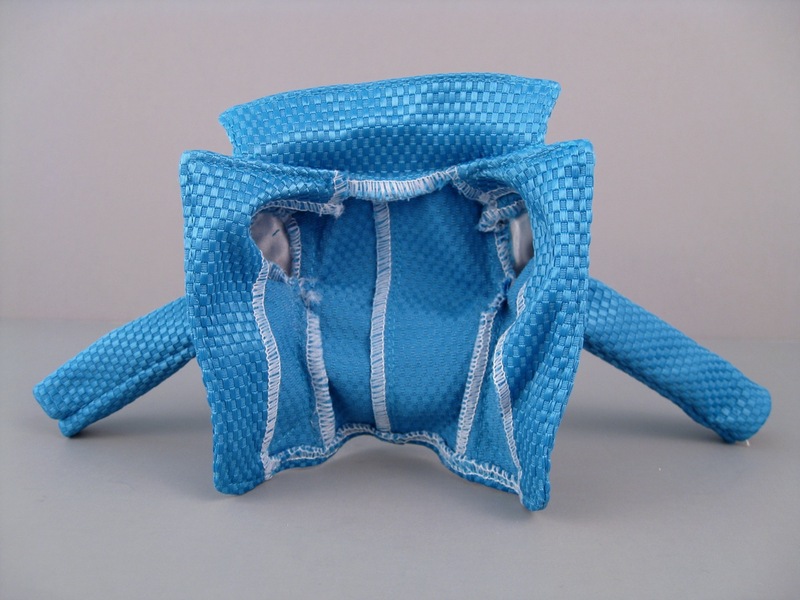 Her waist and ankles are protected with a layer of foam. 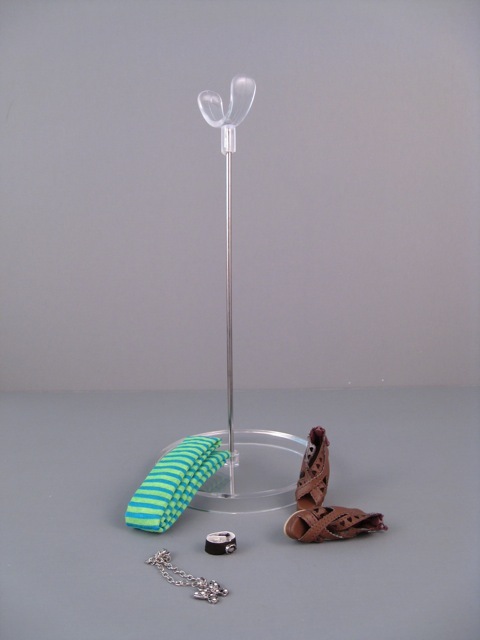 There is a stand secured to one inside edge of the box and accessories stapled to the other side. 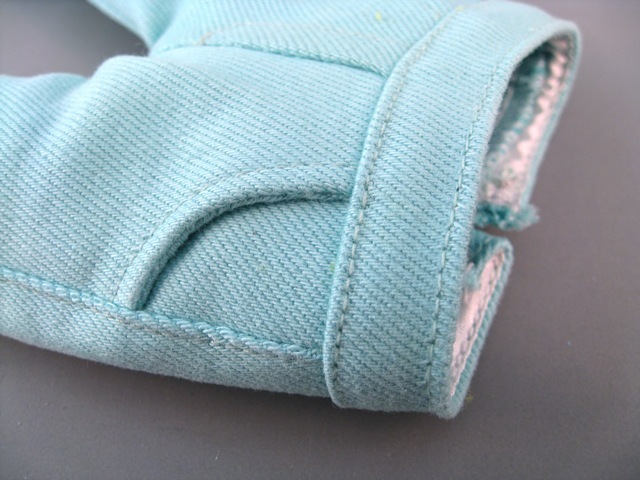 The zipper is such a nice detail for something so tiny. As it turns out, it's not necessary to undo this zipper to get the shoes on and off, but it looks amazingly neat. I also like the design of the necklace that comes with this doll. 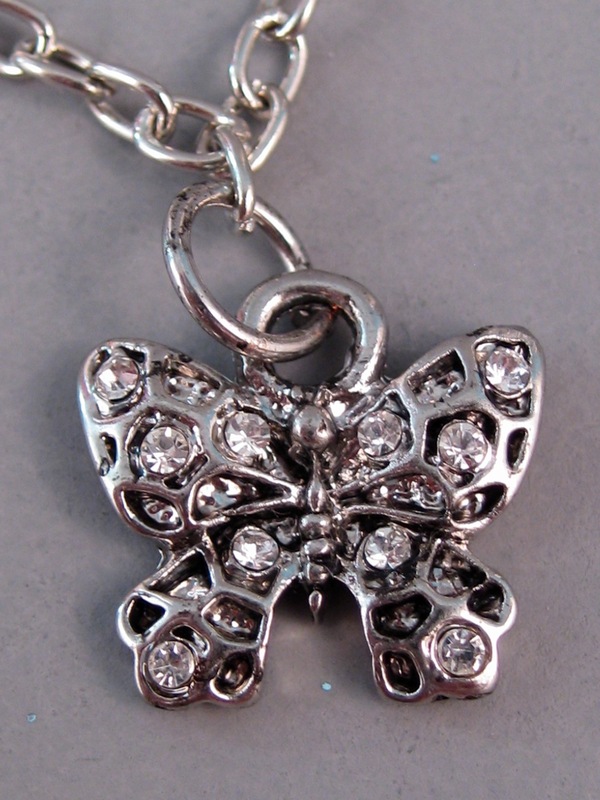 It is a long silver chain with a butterfly charm on the end. 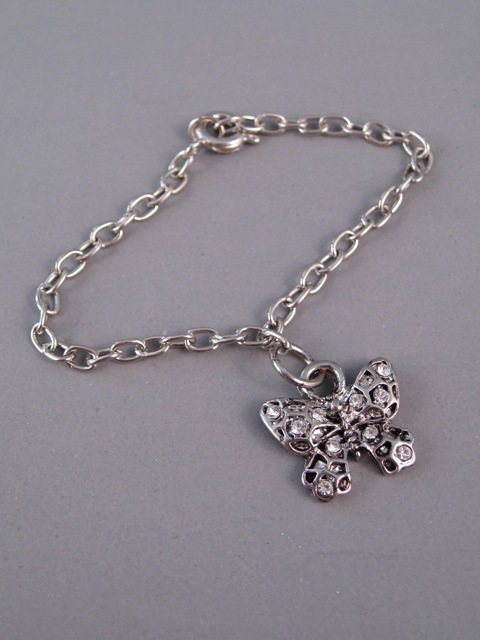 Both the chain links and the charm are very large in scale for the size of this doll, but the butterfly is ornamented with rhinestones and is quite pretty. It's a good fit for Penelope's spring-colored outfit. 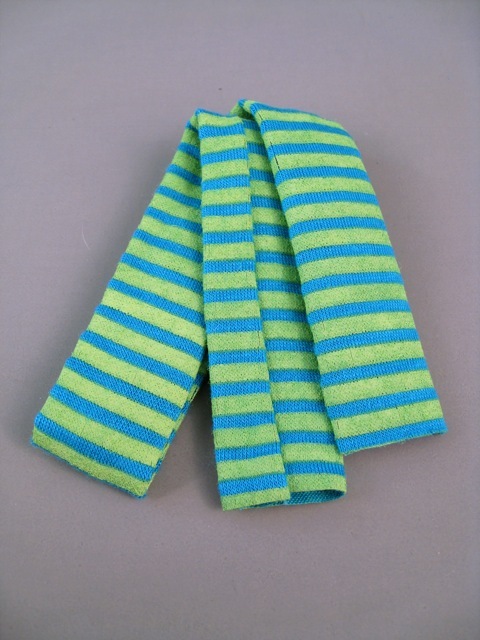 Penelope comes with a jersey knit striped tube scarf. The fabric of this scarf is stiff, but the colors are fun. You can see a reflection of my camera in this picture! Penelope herself comes dressed in a bright three piece outfit. 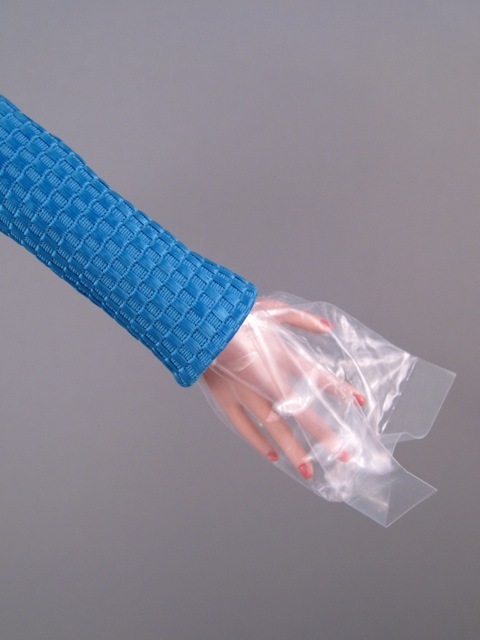 Her long hair is contained within a hair net and her arms and hands are protected with plastic bags. I slipped her shoes on and tried to get her to stand on her own. She stands fairly well, but has to bend a little bit in the knees to get perfect balance. It looks like she's slouching. I also really like the style and fabric of Penelope's jacket. 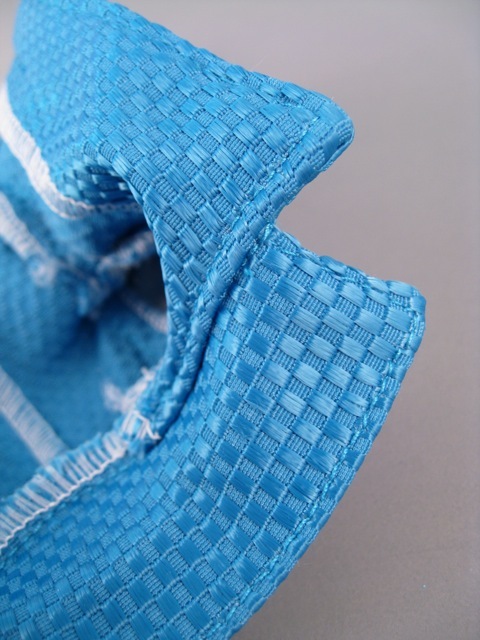 It's bright blue and has a woven checkered pattern with a slight sheen. 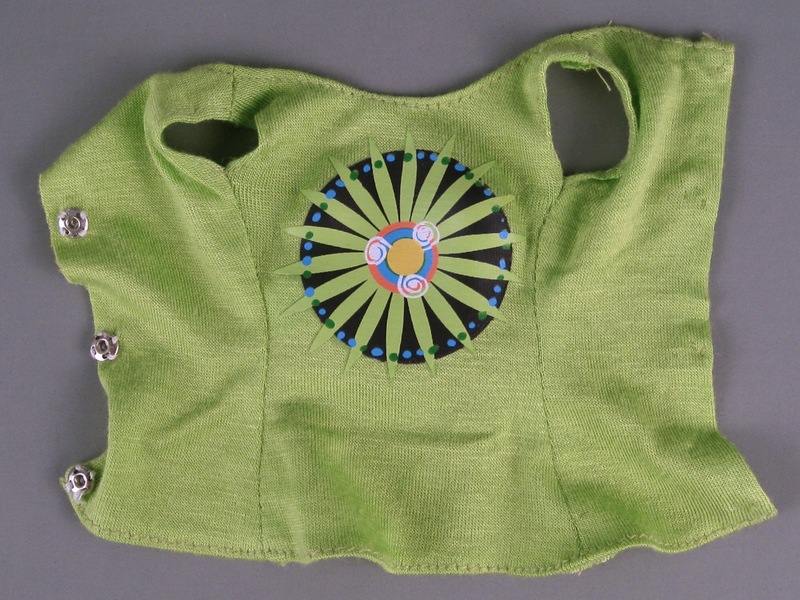 It reminds me of the unconventional materials challenges in the TV show, Project Runway--when designers are asked to make gorgeous clothing out of things like vinyl placemats. The jacket causes a bit of a problem, though. I wanted to remove the plastic that was covering Penelope's arms, but I couldn't do that without removing the jacket, and I couldn't remove the jacket without removing Penelope's hands...and I had a hard time removing Penelope's hands without removing the plastic! Get these off of me! I finally managed to pull the jacket's sleeves up far enough to get the plastic un-taped, and was able to remove the hands. 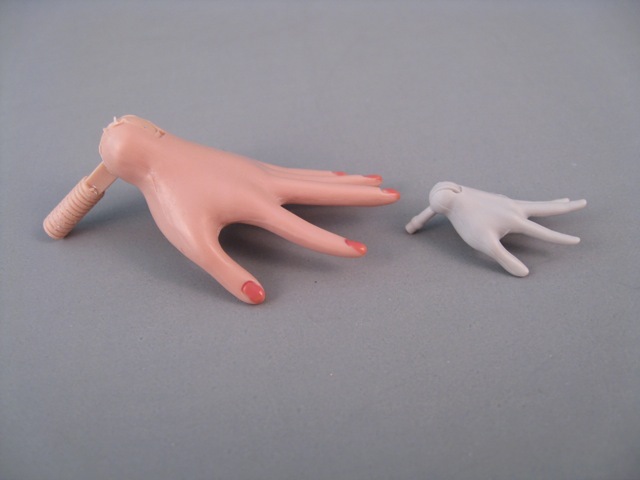 The hands come off easily, and are apparently interchangeable with Tonner's Tyler doll hands. Some of the Déjà Vu promotional pictures made me worry about the prominence of the black paint that outlines this doll's teeth. With my doll, at least, the black outline of the teeth is faint and only partially there. It looks a little funny up close, but from a distance it gives nice definition to the teeth without being obvious or unsightly. Collectors have commented on similarities between the Déjà Vu dolls and Wilde Imagination's Evangeline Ghastly. I guess I can see why--both dolls have large heads, dramatic eyes and prominent mouths. Penelope's face isn't perfectly symmetrical, so she has a slightly different look in each of her profiles. I think the left side of her face (the right photo, below) has a more irritated or focused look, probably because of the lower placement of the eyebrow on that side. The jut of Penelope's lower lip is also more pronounced on her left side. The hair is also very static-prone...at least in my house! 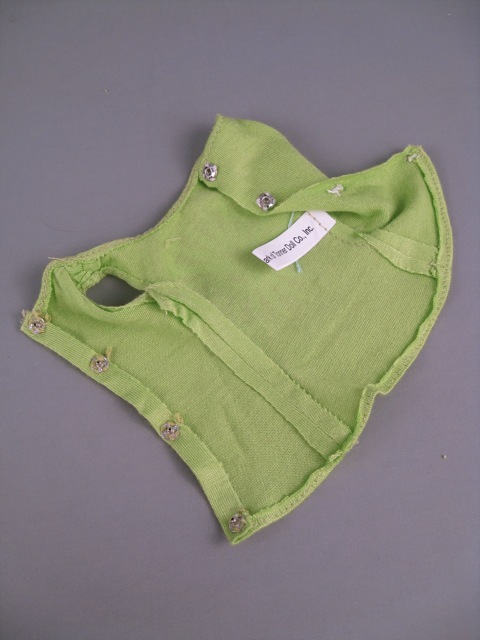 The tank hangs down over the waistline of the pants, and closes in the back with metal snaps. 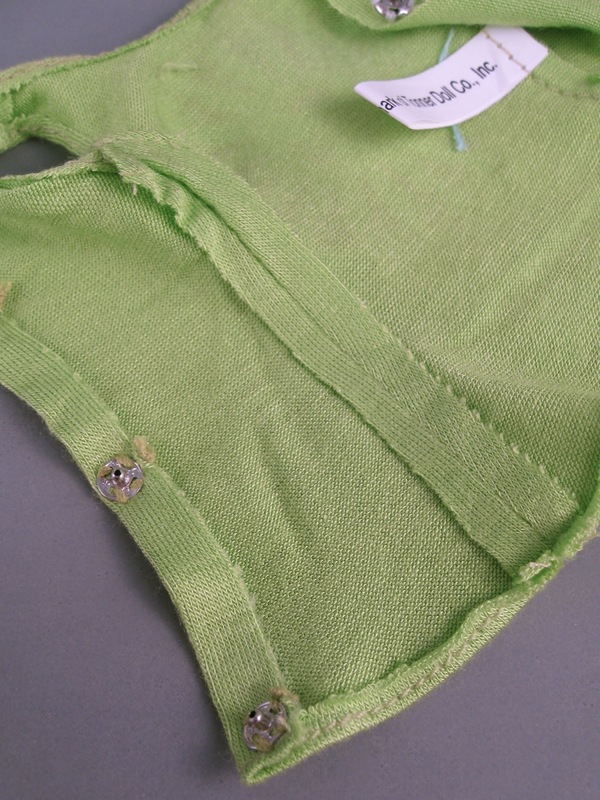 The tank top is made out of a very thin, stretchy jersey knit. The tank is extremely simple in its construction. 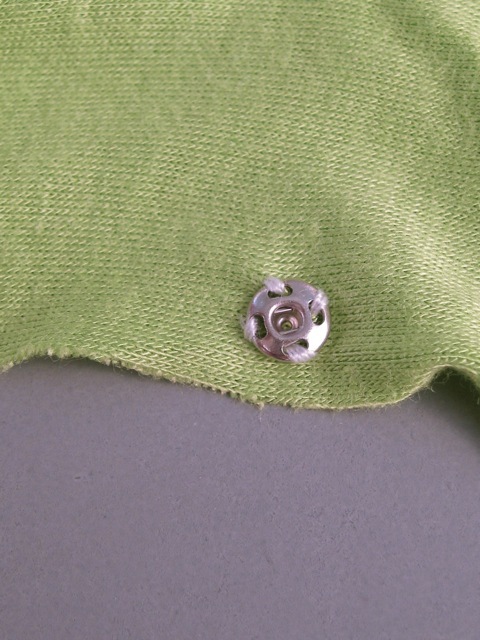 The seam allowance along the bottom of the shirt is small and so it's difficult to get this area to lay flat. These pants fit like a glove and have real pockets in front. Despite their snug fit, they are fairly easy to get on and off--at least once you get the bottom area pulled over Penelope's feet. I love the stylish fit and design of these pants, but am not crazy about the color. 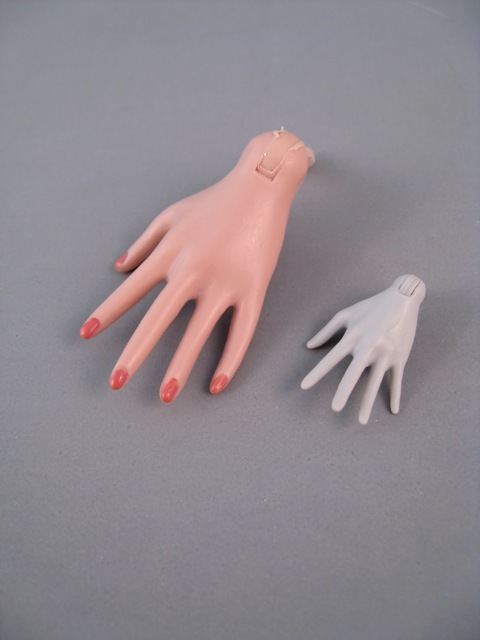 Penelope's hard plastic body is very fair (she has the "bisque" skin tone). She boasts 12 points of articulation--most of which are rotating hinge joints. Her head can swivel around and also look up and down. She has more head flexibility than the other 16" Tonner dolls I own. Her arms and hands have good mobility, although her wrists stop shy of reaching a 90 degree angle. This doll can't easily touch her face, which I find a little frustrating. She seems like she should be able to reach a finger up to her mouth, but it's actually impossible. I realized at this point why Penelope's hands are familiar--and why I seem to automatically expect her to be able to strike poses that she is unable to strike. Hey! Tall human! 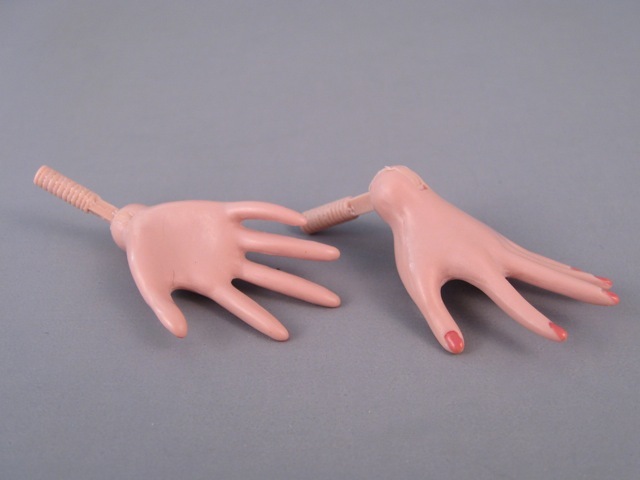 You stole my hands! I mean, the hands aren't exactly the same, but I would say that it's pretty clear the Déjà Vu design team took some inspiration from the wonderfully expressive hands of the Monster High girls. In fact, once I noticed this similarity, I realized that other things about Penelope's body design resemble Monster High, too. She has a very long, narrow-hipped torso (no swayback, though), a small chest, a long neck and an oversized head with heavily-lashed eyes and exaggerated lips. Maybe it's just me, but I think of Freddy Tan's Monster High repaints when I look at Penelope. It's almost like Penelope Brewster is what would happen if Monster High cartoon characters were turned into real people...or something like that. Overall, this doll has a great repertoire of poses. The restricted movement in her hips, her inability to touch her face, and the worry of damage to her knee joints are the three things that hold her back from being perfectly articulated. "Fare Game" Cami, Penelope, "Amy's Cinderella." Of these three dolls, Cinderella has the oldest body, then Cami, then Penelope. 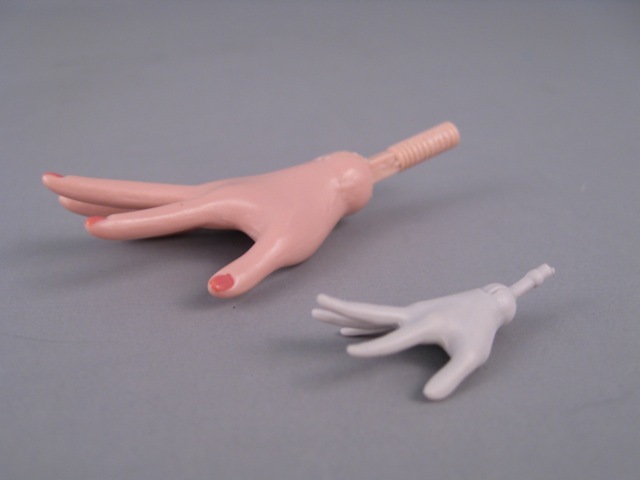 Cami is the only doll with ankle articulation, although this joint doesn't add very much to her posing capabilities. I think Cami's body is the most realistic overall, with the exception of that funny area at the tops of her thighs. There's a clear progression through time with these dolls. The newer the body designs have increasingly slimmer chests and hips. 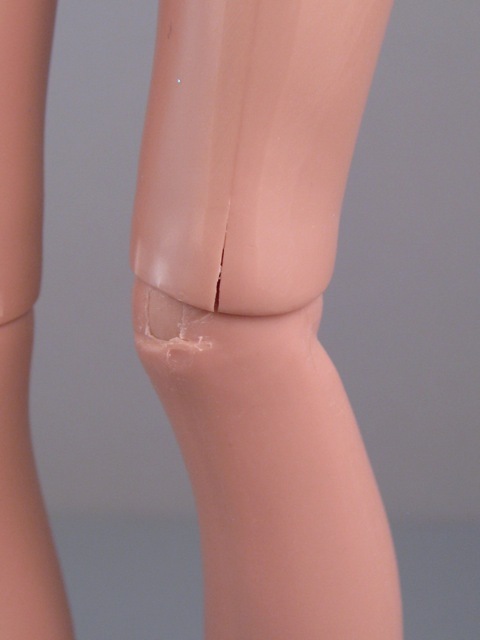 I also think the joints become more and more natural-looking as the dolls get newer. Penelope can't share clothes with Cinderella because the difference in their upper bodies is too great. Penelope's body is most similar in shape and articulation to Cami's. Penelope's head is much more flexible than Cami's, but Cami has slightly better arm articulation (she can't touch her mouth, either, but she can touch other areas of her head). Cami is also completely unable to do side splits. Penelope's clothes are tight on Cami, but I was able to get the skinny jeans on and even fastened in back (however briefly)! Here is Penelope next to a 16" Poppy Parker doll by Integrity. Aside from Poppy's larger chest, these two dolls are quite similar is size and proportion. Poppy Parker "Spring Morning," Penelope. Poppy's articulation is superior to Penelope's. She has highly mobile ball-jointed hips, very flexible arms and much more fluid movement overall. ...and of course she can do some fairly impressive side-splits. Wearing "On Edge's" black dress. After seeing how Penelope looks in some of these beautifully constructed Integrity outfits, I feel less impressed with her plain ensemble. I find the tank top shirt, in particular, to be underwhelming. Also, Penelope can't sit in these pants without popping the snap in the back. Even when she's standing straight, the pants frequently pop open. And I've already mentioned this, but I don't think the pants offer a very flattering profile, especially now that we've seen how skinny Penelope's waist is. One of the best surprises with Penelope is how well she can share clothes with the other 16" fashion dolls I own. For her final photo shoot, I decided to put her back into some the other dolls' outfits and try some mixing and matching. Bottom line? There are things about this doll that I just love, and things that leave me feeling hesitant. The funny thing is, sometimes it's the exact same feature that I love one minute and struggle with the next. For example, I think Penelope has a beautiful, unique face with gorgeous hand-painted details. As I was photographing her, I would sometimes pause--viscerally struck by her glamorous, editorial face. However, especially after looking at this doll for a long time, that same face would strike me as bored and vacant. There were times when I found myself wanting to tell Penelope to either smile or close her mouth. Overall, this doll has an attractive body design and fantastic articulation. 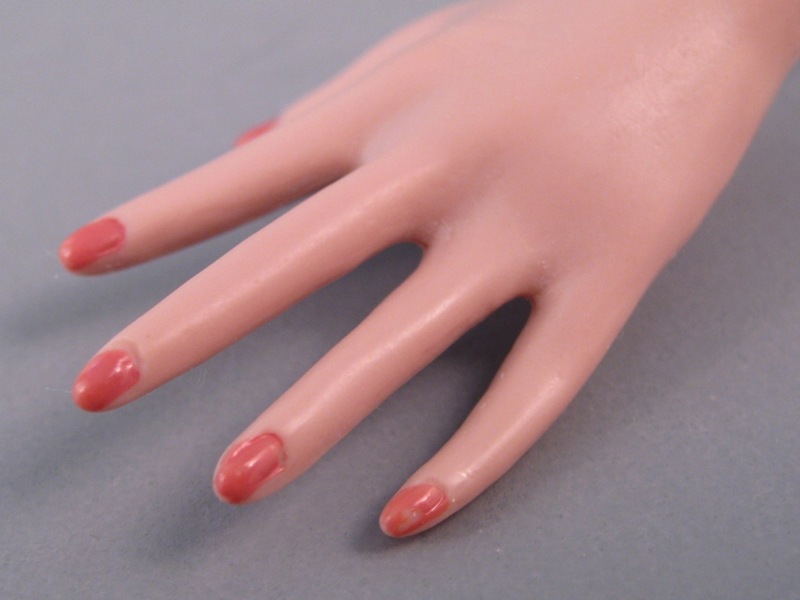 She has many of the things I look for in a fashion doll--a highly movable neck joint, rotation in all of her limbs, and very expressive hands set on bendable wrists. However, Penelope has some hiccups in her articulation. Most notably, she can't touch her face, and she has stiff knee joints that show troubling signs of stress in certain poses. It's great to see a completely new body design--especially if can fit into clothes from other dolls that I own. It's wonderful that Tonner is branching out to incorporate a more stylized doll into his 16" fashion empire. I even think it's fun that this doll takes some of the exaggerated traits of a Monster High doll and blends them with Tonner's own recognizable features. 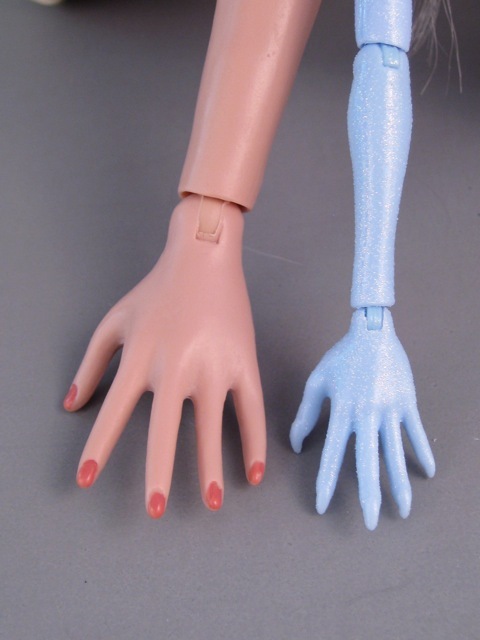 And yet, the level of similarity in the hands (Penelope's hands are virtually identical in shape to Monster High hands) detracts from this doll's originality. Given my fluctuating reactions to several of Penelope's features, it was hard to pull my thoughts together to form a solid impression. In the end, I think that Penelope's face, despite having some blank moments, is her best feature. Her eyes are mesmerizing and realistically painted, and her unusual mouth can come across as both haughty and vulnerable. 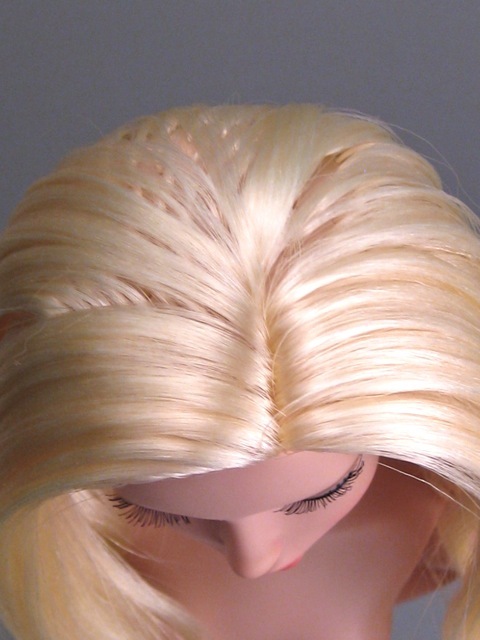 This new head mold offers something quite different to the Tonner fashion doll lineup. Penelope's shapely, articulated body is easily her second best feature. Little frustrations aside, she can strike some gorgeous, expressive poses. I would say that Penelope's outfit and hair are her least impressive qualities. I guess I am just not that excited about the outfit's pieces or its color palette--with the exception of the blue jacket and the brown zippered shoes. 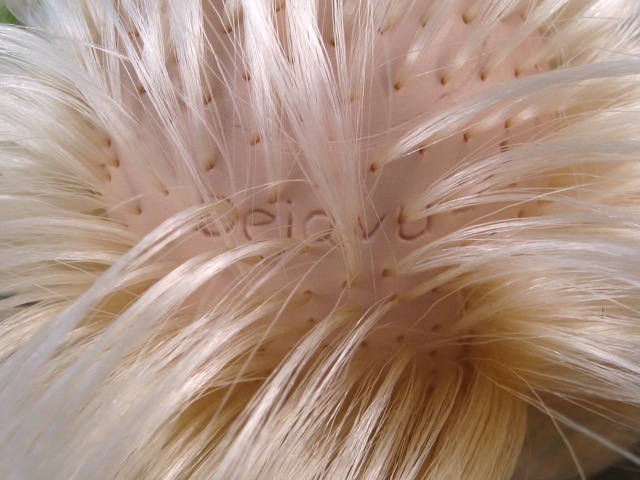 The hair feels great and is comparable to other rooted Tonner doll hair I've seen, but the side-parted style reveals too many unattractive hair plugs. The most telling bottom line, I suppose, is that owning Penelope has significantly increased my lurking at the Tonner site. I've been back at least six times since I started this review to covet the expensive "La Vie de Versailles" Anne De Légere doll. She seems to share Penelope's best features while replacing the mundane Around Town outfit with a gorgeous French ball gown. She also has an elaborate hairstyle to conceal any rooting deficiencies. I think that this face mold takes on a wonderfully romantic quality when it is mixed with the historical details of Anne's 17th century character. I like Penelope enough that I wish I had spent more money and gotten my favorite Déjà Vu doll from the start. At these prices, it doesn't make sense to settle for features that you don't absolutely adore. Hi! 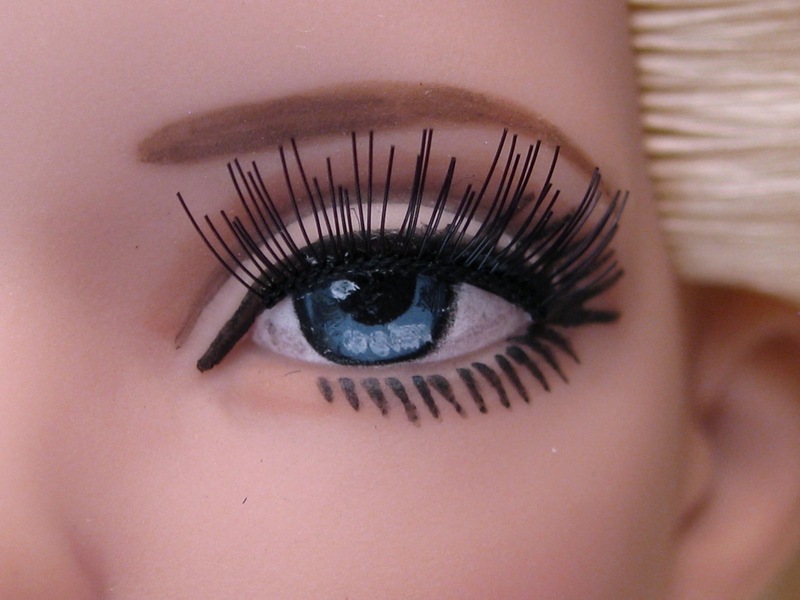 Penelope is a lovely doll, she has such great eyes, very lively. I looked up the "La Vie de Versailles" doll, wow, she is so beautiful! And that dress!!! I understand why you like her so much :-). I really look forward to reading your reviews and learning about the various dolls you own. There are so many amazing dolls available that I was wondering how you decide what dolls to purchase? And where do you keep them all!? I agree, Rebekah! I have seen pants like Penelope's at our local Gap store (in the same color palette) so I know people enjoy wearing them, and they're trendy (at least for Maine) but the color and the style don't do anything for me, personally. I am much more of a LBD person. :) I definitely need to find Penelope a new outfit! I love seeing all the details on this doll - it's a shame about the limitations of the knee joints, but she is lovely overall. And the similarities between her hands and the Monster High hands are such an interesting thing to see! Thanks for that! I did not care for her face in particular, but I love her clothes. 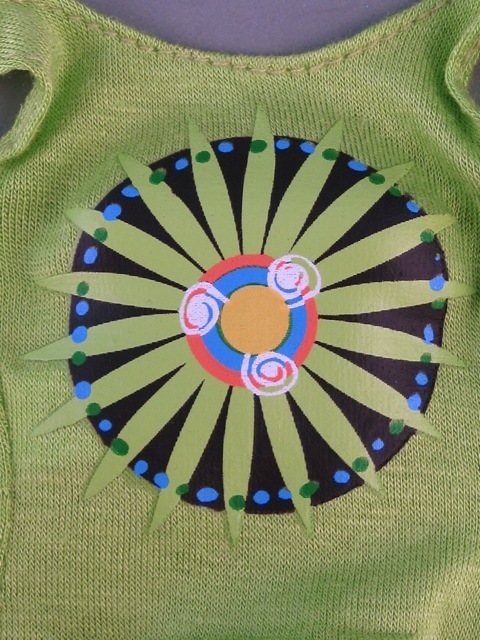 The bright prints and colors- sigh, I wish colors could be the new black again. But on a new note, I discovered a Novi Stars Sila Clops marked down a couple of dollars, so I bought her for her unique glittery skin and of course, her one eye. In your Ali Letric review, you mentioned that Alie's clothes were "teen steampunk monster fashion :)". Silas clothes are distinctly alien, with a space-age silver balloon dress. Best of all, she is wigged! I have had fun buying wigs for her, she has now ended up in a white one. P.S My blogger is STILL broken, so I will just have to resign to commenting as Anonymous. My son was just in New York and when he came back one of his first comments was, "I was the only one there wearing a color. Everyone wears black!" So true! 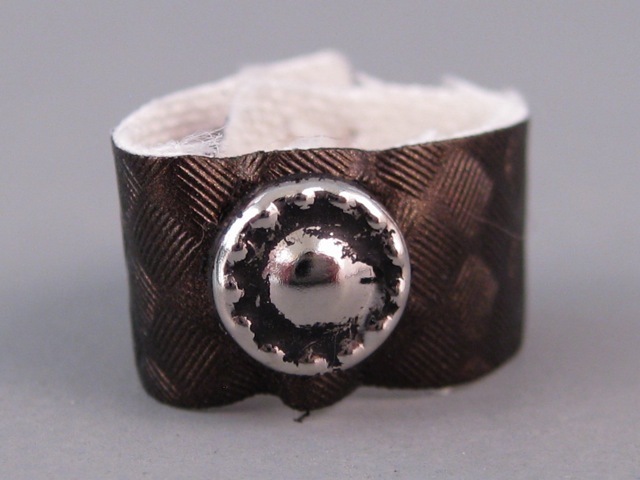 I have noticed the Novi Stars on some excellent sales--glad you found one and that you're having so much fun with her! I have to admit that I grabbed a clearance Novi Star a while back (also wigged), and have been waiting to get her out and see if she's an improvement on Alie. Now I feel optimistic! What size wigs do you buy? 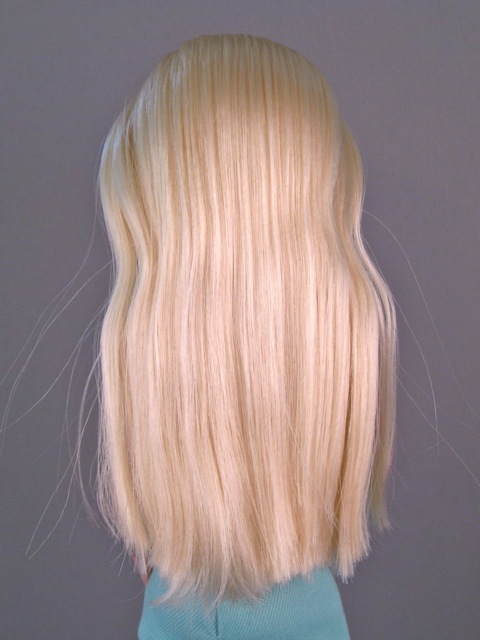 There was a woman on eBay who MADE wigs for novi stars- but alas, I haven't seen her listings for a while :(. I'm not very good with wig sizes, but I would suspect a 8-9 Monique would fit. Hi, great review! I always enjoy spending time at your site. 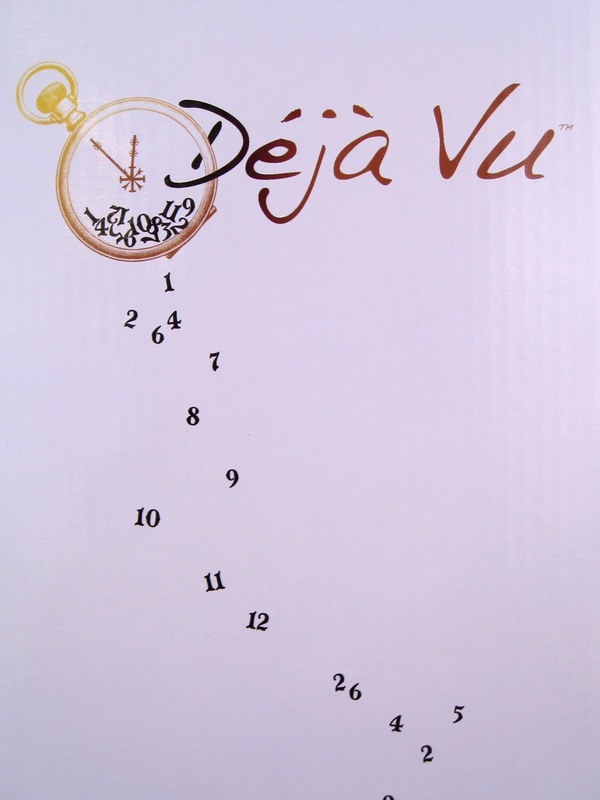 Deja Vu didn't capture my interest when she first launched but she started to grow on me. I bought the Emma Jean basic when she came out and the accompanying 20s era outfit. I liked her so much I altered my doll plans drastically for the year so I could buy the entire Age of Enlightenment collection (with some help from Christmas money but OUCH! My wallet is still sobbing). If I had to choose absolute favorites from the line, the Anne De Leger girls win. I agree that the soft facial screening paired with the Rococo gowns is a beautiful combination and really works with her sculpt. I recently acquired this version of Penelope. I personally love the blue/green color combo of the outfit and the tank top and I'm happy with the overall quality. However, that has varied with the dolls I have received. The 'Dancing the Night Away' dress is pretty but the gold lace overlay is very stiff. The $99 price tag seems darned steep to me. The 'Ma Petite Rose' outfit is better and actually quite beautiful IMO but the snaps on the sleeves won't close. Not a deal breaker but for what it cost, that shouldn't happen. If I have one overall grumble with the line it's the cost. Deja Vu in all her guises is super expensive. But so are a lot of doll lines these days. The Monster High influence is absolutely there but she certainly has her own thing going too. I find her face sculpt quirky and beautiful and I love her body. I'm looking forward to the next round. I hope to see more boxed outfits! Oh, it's fantastic to get this perspective! I was torn between getting the basic Anne doll and the pink dress or getting La Vie, and then I just gave up and ordered Penelope! I feel bad when I blog about a doll that was not my first choice because it doesn't give the line its best chance at a great review. But oh, man, I agree about the prices. It's staggering to me that a 16" vinyl doll would cost over $200...but you're absolutely right that it's not uncommon these days. Some of the Tonner dresses I've seen would be totally worth that price, but others take a lot of shortcuts in fabrics and construction, so without seeing the dresses in person, I am nervous about plunking down SO much money. Since you have them both, may I ask which dress you prefer--Ma Petite Rose or the Versailles dress? Wow, Penelope is quite the stunner! I'm not quite in love with her face (to me the lowered eyelids make her look bored), but she looks glamorous in the yellow and black dresses, and those shoes are really something. Sorry to hear about the bad leg joint, though - will you return her and get "La Vie de Versailles"? Hi, N! Great observation about the lowered eyelids! I hadn't noticed exactly what it was that gives her that slightly bored expression. I won't return Penelope since I've already played around with her a lot, but I am definitely still tempted by the Anne De Legere dolls. Not sure I can manage that price right now, but I keep finding myself back at the site looking at those close-ups...sigh. What a beauty! I can't say that I'm a fan of Penelope's face, although she does look like she's recently been bonked on the head with that unfocused, mouth-breather expression she's got going on. Maybe it's intentional, considering her backstory? How disappointing that her knee joints and upper thighs seem to be so fragile, though! I agree with Steph, Penelope looks so much like Scarlett Johansson, that's all I can see when I look at her. Anyway, she is very pretty. 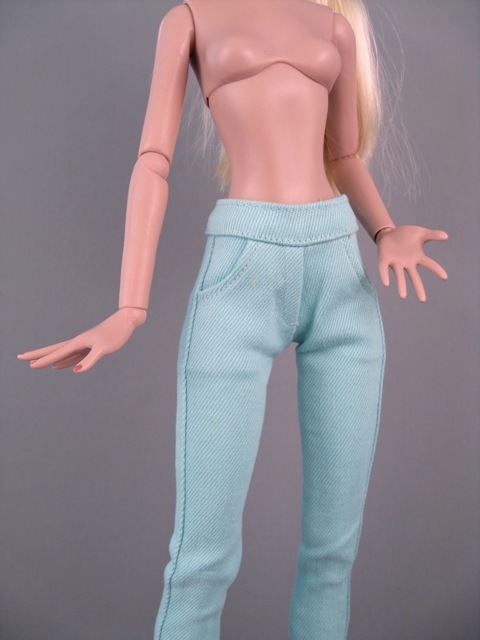 I will have to go check out the Tonner website to see her other versions. The wristband...does it help if you think of it as her boyfriend's? Did you know your last Deja Vu link takes you to a pair of Chinese Laundry booties at Macy's.com? I bought the Roaring 20's Collection during one on their sales. It was still kinda of expensive but... I wanted the red head and dress and my husband preferred the blond, so he convinced me the collection was the better deal. She really is a lovely doll. I adore basic red. She has the perfect expression and both her nightie and the dress are really cute and detailed. A Slight Chill is also very nice although her blue dress is very loose and her worried expression makes me wonder what happened to her. It's kind of sad knowing she'll never be comforted. She is so beautiful! I have to agree. Her face has to be her best feature! I also want to say I really enjoy your reviews. I never suspected she'd fit so many clothes. Yours has a very pretty face and that blond hair is gorgeous. Great review! While I'm astounded at a doll in this price bracket already cracking in seams from your minimal posing - especially in comparison to monster high - I do like the doll herself and would buy her if I collected in this price range. The story herself really intrigues me - I wish it was a book as well because I'd be ALL over buying it. I went to Wilde imagination 's website and I found new versions of Evangeline which looks very beautiful too! I love the new body in spite of the shortcomings. The fanned hands are my least favourite thing to be copied from MH, but the rest is very nice. This is the kind of body I'd look for if I ever found myself in this price range. Thank you so much for reviewing this doll! I've been waiting to see if you would review her, I love your reviews! And I haven't really found real reviews for this line. When Tonner first announced the dolls, I did not like the sketches they are based on, but once I saw the Rococo ones I fell in love! I really wish I could afford at least one of the 18th century dolls, but as a student I really can't justify spending that much right now! And I keep waiting for their sales and they always exclude the Deja Vu line! :/ I eventually want one of these dolls but not now. At least I can live with the fact that we're doing 18th century at school so I'll have my own Court Gown to admire! 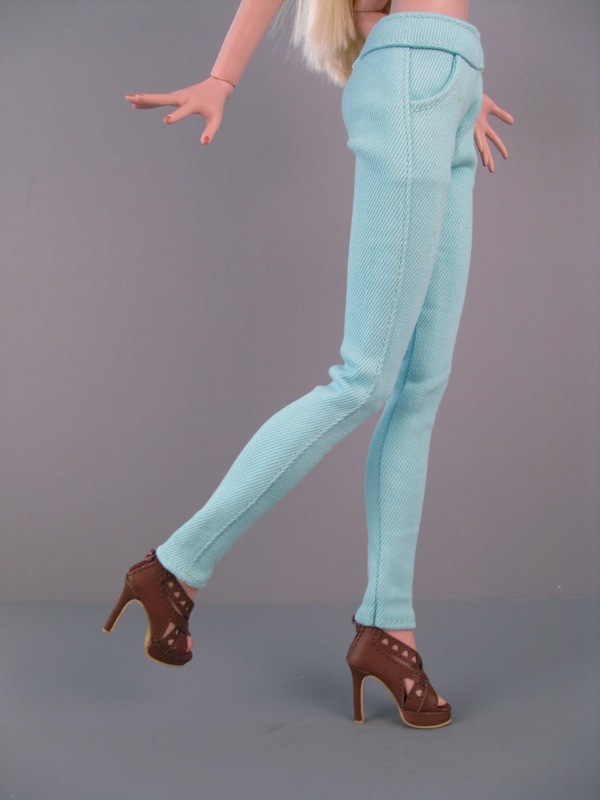 I absolutely fell in love with the very first promo pictures of the new Deja-Vu body (http://www.tonnerdoll.com/deja-vu-body-style), and when the actual doll listings came out I bought the basic Emma Jean redhead. Unfortunately, I feel like the real doll doesn't quite have the charm of the original pictures because her eyelids are so lowered; it's bored/sultry rather than wistful. I want to love her, but right now she's still boxed up after my recent move. I am excited to see what else will come from this line when the book is released. Maybe some of the love interests? 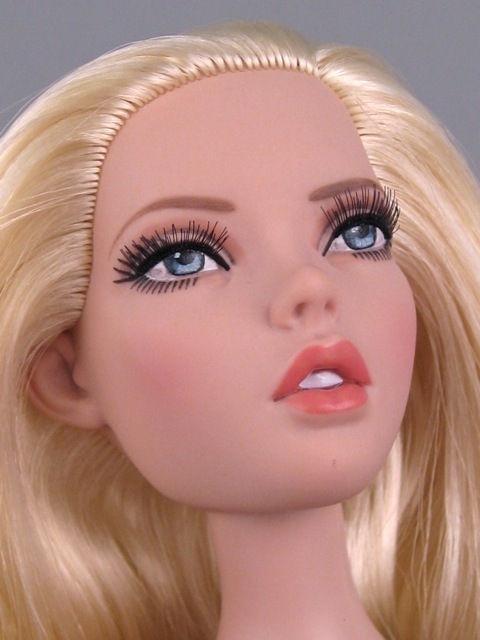 Tonner doesn't have enough good male dolls. Before i clicked the link to this blog, i saw the picture and i thought this doll is Natalie Dormer of Games of Thrones.... Do you see the similarity in the first photo? Amazing! I am torn between purchasing the dark haired flapper or an Evangeline. Any input? Thank you Emily. My Flapper is on her way. Any reason Evangeline found a new home? Just curious. I've only ever been a low budget collector and some years ago I got into Gene dolls (thought that was extravagant) and then packed it all away and never looked back. Recently, I unpacked the dolls and started selling them on ebay. As I looked around for value/prices I kept seeing this new creature Emma Jean, the flapper. The more I saw her the more I liked her and I've been searching the internet for a good detailed review... and finally found you! Today, all my curiosity and wanting accumulated into my purchasing the flapper set... yes, two dolls and those exquisite outfits... most expensive doll purchase I've ever made in one sitting... and, my lust for this doll didn't stop there, oh, no... I had to buy clothes and shoes and wigs and I haven't even gotten the doll yet! I'm truly head over heels about this doll. Thank you for the detail and great photography and the info about her size and ability to share clothing. I've justified my extravagance with the money I've made selling off all the old dolls and their stuff... some I wish I hadn't been so quick to sell. I love this doll's face and her articulated body. And, yes, I can see a slight bored look to her which I think is all the more appropriate for the flapper... she's so cool and aloof... the flappers were adamant about being considered new women, modern independent women, rebellious and smart and all about breaking the status quo for women of their day... now, that's my kinda girl. Hope you don't mind if I come back and let you know how my unveiling goes in a few days? I'm old now and I doubt I'll ever have this opportunity to splurge again, nor, have I ever been so smitten by a doll... well, not since Betsy McCall when she first came out a life time ago... that, and, I have no one to share my joy. Glorious day and you really helped me make up my mind; very much appreciated. Grandma ~ still plays with dolls! How wonderful! Thank you so much for sharing your story. It truly makes my day (my week!) to hear that a review has helped someone find the right doll. The more I look at the Deja Vu dolls, the more I think Emma Jean is the best of the bunch. I liked Versailles best at first, but now if I bought another one, I think it'd be Emma Jean. She's truly special and I hope you love her in person! She does have a fantastic, rebellious personality. I very much hope you'll come back and share the unveiling! In fact, if you email me pictures, maybe I can make a short post to share with everyone? Your first impressions could help others take a similar plunge with confidence. The dolls aren't cheap and it is so hard to make a good decision--often with just promotional pictures available. It is SO fun to be waiting for a new doll. I am excited for you! New dolls and cake still make me unreasonably happy. :) Thank you again for this lovely comment--can't wait to see your update! Thank you, Emily... how sweet of you to indulge me... I should get the set tomorrow... yes, I even paid for expedited shipping! I'm beside myself with anticipation! I am partial to the 1910-1928 era; I do genealogy and my favorite family members were in their prime during this period. I found a great deal on Ashton Drake's 16" Titanic Rose's outfits on ebay and between the flapper outfits and the 1912 time period of the Titanic, these girls will represent those women. Hopefully, I'll get the clothes soon and will be able to share pictures of them in costume. Emma Jean is a wigged doll and although, Tonner is adamant about not trying to remove their wigs I'm going to give it a try on one of the dolls. Do you have any suggestions on how this works? I promise not to bombard you with my pictures or story, however, it's very satisfying to have someone to share with... need to get my giddy self into laundry mode for now! 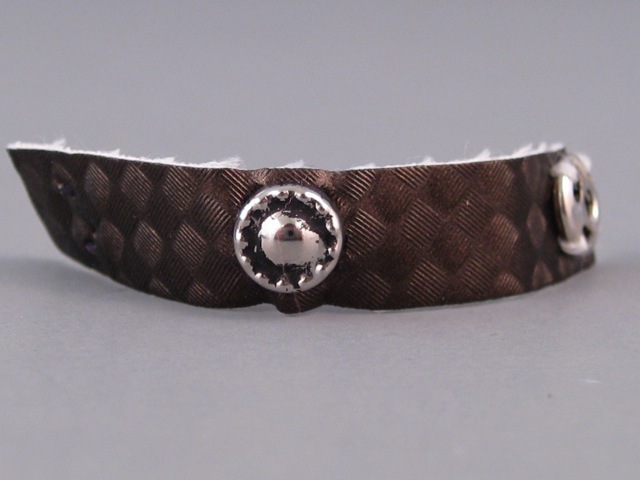 Correction: not Ashton Drake... Franklin Mint. 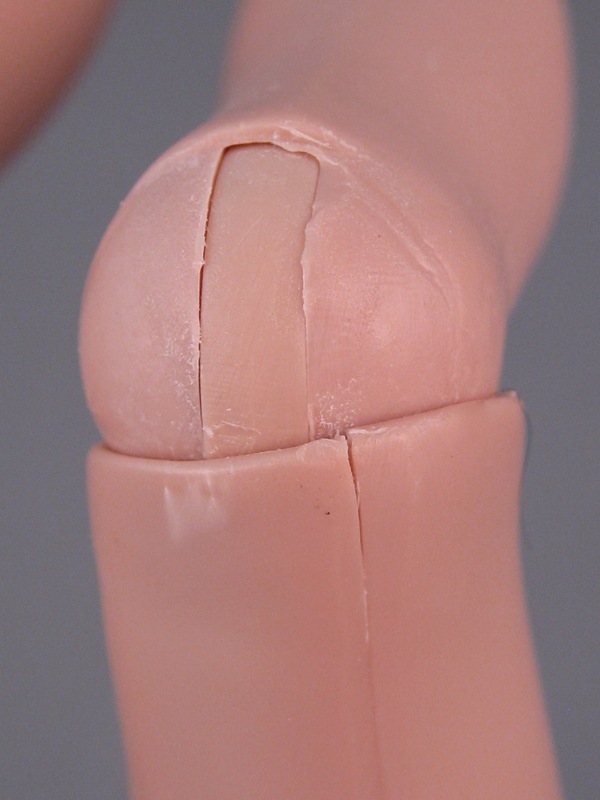 I understand they use Tonner's Tyler body, regardless they fit on Tyler via pictures sent by the seller... I might have to tailor them a bit for Emma Jean! They're here!! Oh, my, I can't even begin to tell you how much I love, love, love these dolls!! They are stunning! Felt just like Christmas to a 5 year old! I was tentative about opening the boxes, lest, I hurry this moment of glee and anticipation… my delight in seeing them met all my expectations! Awww... it's what I call a hug-the-tinsel kind of moment, words just fail me. I wasn't sure about getting into 16" dolls again, as the Gene dolls always seemed so big... albeit, my Gene dolls were the stiff original bodies that were unable to pose much beyond standing. These girls have a small frame and look delicate. Tonner is, by far, my favorite designer because of his face sculpt, coloring and attention to detail. They both seem to have a full head of hair, the red head has a longer bob than the blonde, neither have bald spots immediately visible although, their hair around their face is stiff with setting gel... both have dark heavy eye make-up with perfect lashes, the red haired one has lovely green eyes and dark fuchsia lips and the blonde has blue eyes with red lips. 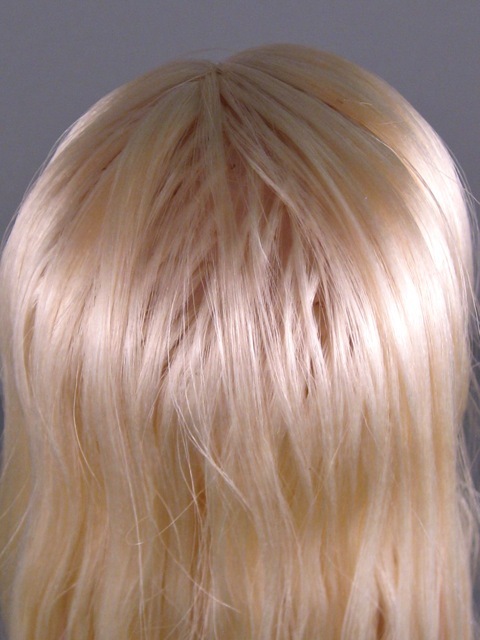 The blonde came with hands wrapped in plastic, plastic around her body to protect her from clothing stains and foam to protect from ribbon marks. The red haired one did not have any protective coverings other than the hair net, which they both have. As I look at them, there is something kinda cartoon-ish about their proportions, they are very stylized dolls with their long thin necks but, I think that's what I love the most about them. These dolls are in line with the demand of the newer big eyed and big head dolls coupled with delicate body features yet, understated enough to appeal to those of us that are looking for a more realistic looking fashion doll... or should I say alter ego! OMG! I love Penelope! The only trouble is that she is way out of my price range. She is so pretty, and I think her story is so cool. Thanks for all the pictures and detailed review. I finally caved and ordered Penelope when I not only got her on sale, but was able to add one of my Willy Wonka tickets with 10%, free ship and no exclusions so Deja Vu line is included. I have all of the Emma and Anne dolls and clothes from the 2013 line. Just two little corrections. Anne's time before she meets her tragic end is about 1780-85, based on the first outfit "My Afternoon Stroll" which puts her smack dab during the reign of Louis XVI. All those French kings named Louis, one after the other. The formal court gowns are dated a little earlier--the French and English court gowns style changed little in cut over a fairly long period of time as just the materials and trims changed. I'm longing for a medieval, Tudor, or Elizabethan doll in the Lily skin tone for the Tonner and Modern Doll conventions, but fear we are going to be offered "Judy, Judy, Judy.' 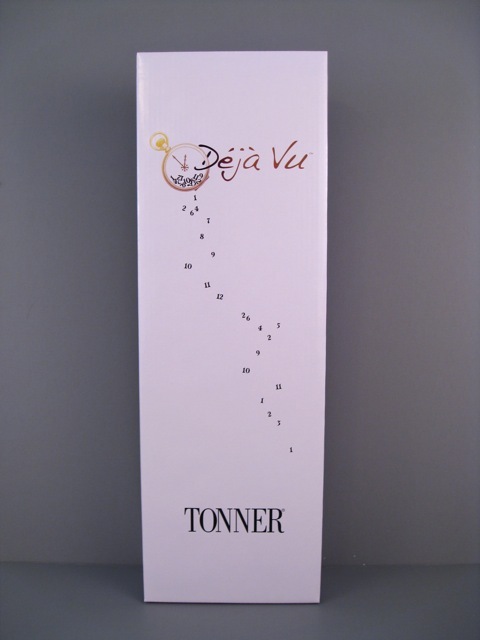 unless Tonner offers two new characters in the Deja Vu line this year. Thanks for the great review! You have shown me how beautiful and versatile this doll really is. Thank you! Hello.I saw the promo pics for these and loved them.Then I saw your pics and the link to your blog and this review.Thank you so much for all the info,it really helped me to decide and I just got both Penelope "Around Town" and "Production Assistant".I really love them! I have other Tonners as well,but I think Penelope is so unique.Her face is just so endearing and sweet.Most of my collection is from IT,but i'm starting to lean more towards Tonner as I feel the quality control is slipping with IT.I've just had too many issues with many of the dolls.I was wondering if there are any other blogs just for Tonner,it would be nice to be able to share.Anyway,thank you again for the all the great pics and the review! I think she does look like a cross between a Monster High doll and a Dollmore Zinna doll! 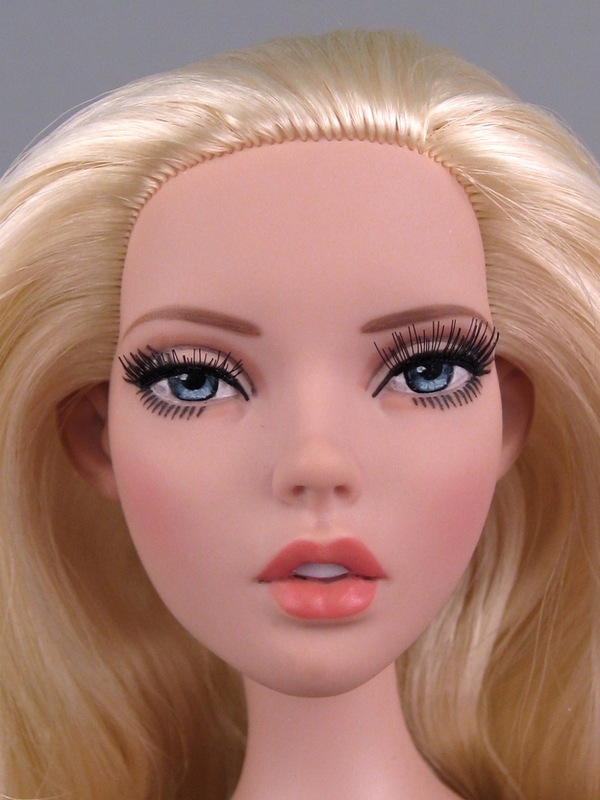 Another doll that shares Deja Vu's facial look is Doll Chateau Isabel. Did they forget about the show Punky Brewster? Her name is Penelope Brewster. I love that show!